Sequels generally exist for one of two reasons: because there’s a creative, story-based purpose or because the earlier film made a ton of money. Like most of the Pixar sequels, Incredibles 2 has been brought to the screen because Disney saw an opportunity for box office dominance (as if they haven’t had enough of that this year with their one-two Marvel punch). That’s not to say that financially-driven movies can’t be entertaining – Incredibles 2 is arguably the best Pixar follow-up since Toy Story 3 (moving past Monsters University, Finding Dory, and the unfortunate Cars 2 and Cars 3). But, constrained by expectations and established character/plot limitations, Incredibles 2 lacks the freshness and ingenuity displayed by its predecessor. It’s good, fun family entertainment but it’s not incredible. In 2004, when The Incredibles was released, the superhero genre was at a different point in its evolution. There was no Marvel Cinematic Universe. Batman had not yet entered his Dark Knight phase. The incumbent Superman was still Christopher Reeve. Spider-Man and X-Men were fresh commodities. In a way, The Incredibles was a PG-rated Deadpool, gleefully poking fun at superhero tropes while providing a legitimate story along the way. Directed by The Iron Giant’s Brad Bird, it was rightfully hailed as “another Pixar triumph.” It has taken 14 years for the sequel to reach the screen, in part because Bird struggled mightily with writing another episode that wasn’t a complete retread of the first. Although more than a real-world decade has passed since The Incredibles (someone who watched the first installment theatrically as a kindergartner is now in college), in the movie’s timeframe, not a second has expired. Incredibles 2 starts off where The Incredibles left off – with the sudden attack of a mole-like villain called The Underminer. Working as a four-person team – Mr. 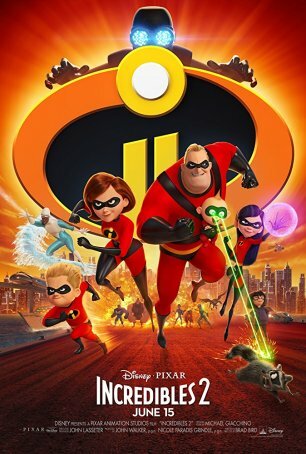 Incredible (Craig T. Nelson) and Elastigirl (Holly Hunter) with their kids, Violet (Sarah Vowell) and Dash (Huck Milner) – and assisted by their buddy Frozone (Samuel L. Jackson), The Incredibles defuse the menace but not without collateral damage. Although not prosecuted for breaking the superhero ban, they are forced into obscurity. Enter the brother-and-sister team of Winston and Evelyn Deavor (Bob Odenkirk and Catherine Keener), who have a plan to force the government to overturn the anti-superhero law. It involves proving the value of the “supers” to the world with Elastigirl as the face of this movement. So, while Mrs. Incredible starts her spree of crime-stopping, which includes confronting a new supervillain called The Screenslaver, Mr. Incredible stays home to raise the kids. Violet has boy trouble. Dash can’t understand “the new math.” And the baby, Jack-Jack, is sprouting all sorts of new and unpredictable powers. When focusing on Elastigirl, Incredibles 2 works as an action-oriented superhero movie. When zeroed in on Mr. Incredible, it’s a companion piece to Tully about the difficulties of rearing children in a single-parent environment. The latter element elevates Incredibles 2 above the level of a generic animated superhero movie. The characters are recognizably the same ones we came to know and love in the original The Incredibles. Through the magic of animation, they look the same. Although many recent Pixar films have been focused on visually one-upping the company’s previous efforts, Incredibles 2 is content to mimic the look and feel of its predecessor. There’s nothing wrong with that. Incredibles 2 looks great, but so did The Incredibles. Although all of the actors have aged, their voices remain constant and most of the original performers were able to reprise their roles. (One notable exception: Spencer Fox, the first Dash, couldn’t return because he underwent puberty and its associated voice change. Huck Milner steps in without missing a beat.) Catherine Keener and Bob Odenkirk join the cast as characters whose motives seem too good to be true. As with nearly all Pixar films, this one is designed to work on two levels although, in this case, it almost seems as if the screenplay is weighted a little more toward adults than children. There’s plenty of visual pizazz and action to keep the kids engaged (although some may become restless toward the end – the movie is unusually long for an animated feature – with the 7-minute short added in, the running time is close to two hours). But the Mr. Mom sequences will resonate more strongly with parents than their offspring. Bird, who came to Incredibles 2 after developing the disappointing Tomorrowland, has rediscovered enough of the mojo that made The Incredibles popular to guarantee that this movie will reach the stratosphere. In an era when animation is big and superheroes are bigger, it’s hard to imagine Incredibles 2 not dominating June’s box office. The movie doesn’t break new ground nor is it as openly satirical as the original. But it’s fast-paced, funny, and – most importantly – doesn’t disappoint. It gives us a chance to reconnect with characters we fell for in 2004 and discover that, although we may have aged, our affinity for them remains constant.